It's October 1942, in Oslo, Norway. Fifteen-year-old Ilse Stern is waiting to meet boy-next-door Hermann Rod for their first date. She was beginning to think he'd never ask her; she's had a crush on him for as long as she can remember. But Hermann won't be able to make it tonight. What Ilse doesn't know is that Hermann is secretly working in the Resistance, helping Norwegian Jews flee the country to escape the Nazis. The work is exhausting and unpredictable, full of late nights and code words and lies to Hermann's parents, to his boss... to Ilse. And as life under German occupation becomes even more difficult, particularly for Jewish families like the Sterns, the choices made become more important by the hour: To speak up or to look away? To stay or to flee? To act now or wait one more day? In this internationally acclaimed debut, Marianne Kaurin recreates the atmosphere of secrecy and uncertainty in World War II Norway in a moving story of sorrow, chance, and first love. Why Did I Listen to Almost Autumn by Marianne Kaurin? 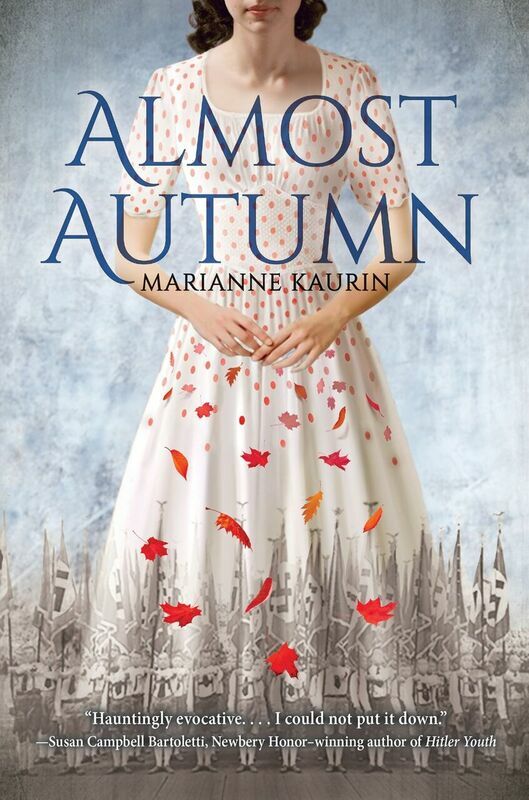 Almost Autumn by Marianne Kaurin has quite the stunning cover and I am always taken in by a beautiful cover. In addition to the cover, I felt like the subject matter of the story seemed quite timely, given the times that we live in and that executive order for the ban on immigrants from I think seven Muslim countries. Anyways, I saw Almost Autumn on Hoopla and was like, I am not getting to my ARC anytime soon, might as well give this a listen. Marianne Kaurin’s Almost Autumn is a translated book set in Oslo , Norway in October 1942. It is set as the Nazi Occupation is getting worse. Ilse Stern is about to meet Hermann Rod for their first date at the movies, but Hermann doesn’t show up. You see, it turns out he misses the date because he is in the Resistance and helping Norwegian Jews escape into Sweden, I think it was. Anyways, the story intensifies as the weight of the Occupation bears down on the Sterns – Ilsa’s dad is arrested. Her family is made to register. And of course, the oppression and the horrors continue to stack up from there. No spoilers, but Hermann and Ilse eventually do get their date and what happens from there is surprising and heartbreaking. What Did I Think Of Almost Autumn? So, Almost Autumn is written in a way that is certainly different. I mean, it’s written in present tense from I think second person? Or close third person? I don’t know, I am not exactly a literature expert. It’s just different. It took a bit of adjusting for me to get used to the style of writing. I did find this story to be important and one worth reading. Almost Autumn isn’t going to become a favorite for me, but I would recommend it to anyone looking for a book about the Holocaust set in Norway. It does a decent job of showing how quickly the events escalated. The book is narrated by Taylor Meskimen. I listened to the audiobook at a rate of 1.5 speed. Ultimately, I was not in love with the narration. So, I never fully gelled with it. The gravitas of the story did not really come through for me in the narration. There were also times when of course, my attention wandered and I got bored with the narration. I would recommend you give the physical book a chance before listening. Results may vary. The cover really is striking and I don’t normally enjoy reading WW2 novels but something about this has drawn me to it. The writing style sounds like it could be a problem though :/ I’m glad it was worth the read in the end.